As the state’s land-grant institution, Cornell University was born to explore science for the public good – a mission that can sometimes require a leap of faith. Just such a leap is paying off now at Cornell Orchards in Ithaca, as researchers and managers from the Horticulture Section of the School of Integrative Plant Science and the Department of Entomology celebrate a solid spring pollination season for the site’s apple trees. While crisp apples and fresh cider are no strangers to fans of the 37-acre research and outreach site, this year’s crop provides an extra bonus for New York apple growers: proof that pollination can be done commercial honeybee free. 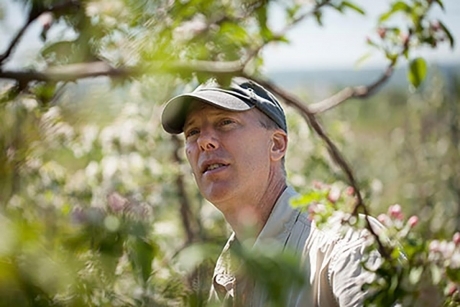 Video: Entomology professor Bryan Danforth discusses the decision this year to let wild bees pollinate Cornell’s apple orchards, steering away from the practice of renting hives of European honeybees. View video.